Headed by Mr. Patrizio Billio, the LOYAC AC Milan Soccer School is considered to be one of the pioneering soccer academies in the region. Players under this program are granted the ability to train under the expertise and knowledge of a highly qualified international coaching staff, while competing with other local soccer academies. Over the years, the LOYAC AC Milan Soccer School has trained hundreds of players, many of whom have gone on to represent our school in several international tournaments. Amongst the academy’s many honors is the proud privilege to be labeled as the first Arab team to participate in the International Youth Peace Tournament in Verona, Italy. On the periphery of one of Kuwait’s oldest and most historical ring-roads; the First Ring-road, lays Al Shaheed Park. 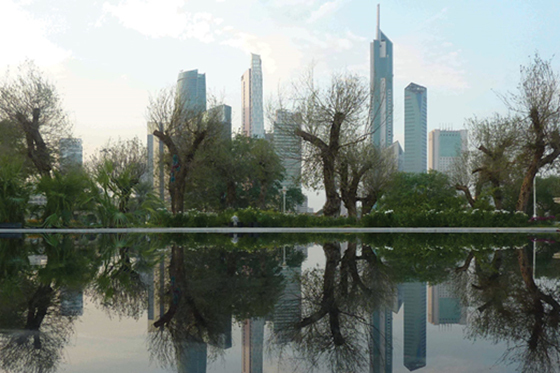 Al Shaheed Park covers 230 Acres of Greenery in the heart of Kuwait City, making it the largest urban park in the country. The park is the first step into reclaiming The Green Belt, which was built to create the transition between the old city of Kuwait and the new expansion of Kuwait City. Developed by Al Diwan Al Amiri and managed by Loyac (a pioneer nonprofit organization focused on youth development), the project of reviving the park grew into a serious devotion for all those working on it. It is the kind of devotion that passionately and professionally narrates the story of a land, a history, and a culture. The Park offers a fully integrated development with cutting-edge architecture and art works. Its Amphitheater diversifies into various cafes and restaurants, different kinds of gardens (Oasis Garden, Museum Garden, Seasonal Garden and others), walkways (Visitors and Pedestrian Passages), and an outdoor theater along with performance centers for concerts, exhibitions, art-shows, and other kinds of events. Al Shaheed landscapes also hold multiple historical zones such as the Memorial zone and the Museum zone. In short, Al Shaheed Park is a multifaceted park that has the ability to engage everybody and every age group. It is a place to invest individual time, as much as enjoy family time, with its various historical and contemporary architectural sites, outdoor and indoor activities, and cultural and entertainment programs. Apply for events or get a media tag, book a tour or join the park guide program! L1 Labs is a creative hub that educates the youth on the arts of animation and illustration, in the context of comic book design, smartphone applications, and more. At L1 Labs, we strive to exceed your imagination’s limits. There is no 'think out of the box’ experience because we do not believe in this so called ‘box'. Imagination is knowledge, and this what we go by and follow on a daily basis. LAPA is Kuwait’s first academy that is dedicated towards preserving and developing a sense of appreciation for the performing arts. Through this program, individuals are given the opportunity to harness their creative abilities while, enhancing their communication skills, creativity and potential for self-expression. Members of LAPA are also granted the opportunity to showcase their talents in music, dance and drama across numerous events throughout the year as well as an annual theatrical performance.